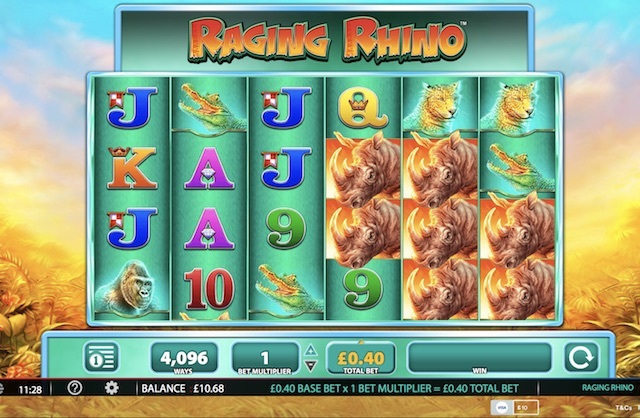 For UK players who like to win big at online slot games, Raging Rhino by WMS is a must to try. The stand-out features of this game are the 4,096 ways to win, where any 2 adjacent symbols on a 6 reel by 4 row set up is a winning combination. That, plus up to 50 free spins in the bonus round, and the chance to re-trigger. And the wins start really stacking up when you get wild multipliers or up to 3x. Raging Rhino has gained a massive following in the UK. It is a high-volatility slot with an RTP of 95.91%. You can read our review and find out where to play here. But if you’re already had your fill of this game, why not try others like it? The following are all games with a similar set up and variance rating. 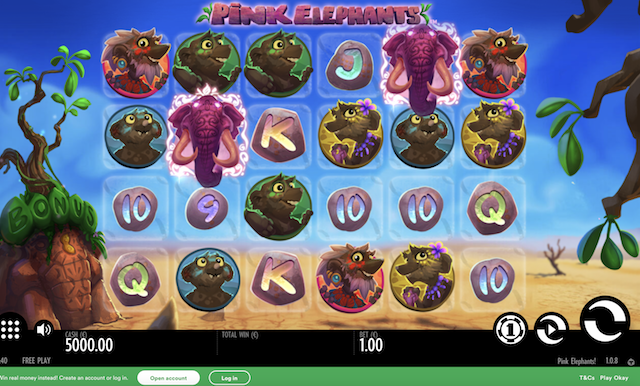 Just like Raging Rhino, Thunderkick’s Pink Elephants, released in November 2017, has 4096 ways to win. It is an equally volatile title, where the wins only really come for those patient enough to sit through a spell of dry spins and get to the free spins round. Here, special glowing orb symbols can turn low paying symbols into higher paying ones, creating more chances of big wins. The RTP is 96.1%, and this game features luxury graphics and really slick gameplay. Definitely one for the high rollers. Have a go at BGO.com today. After the success of Raging Rhino by WMS, it wasn’t long before Playtech got onto the 4,096 bandwagon and brought out Buffalo Blitz. This excellent game features a free spins round with a staggering 100 free spins available, and mutlipliers of up to 5x! This game has a similar epic feel to Raging Rhino, but rather than being set in the safari lands it is set on the American Prairies. You can actually trigger up to another 100 free spins in the bonus round with scatters landing right for you. This game is well worth a try. Have a go at BGO.com today. Anything WMS and Playtech can do, so Pragmatic Play can do too! 4,096 ways to win? Check. High Volatility? Check. Masses of free spins? Check. Jurassic Giants in fact has up to 250 free spins in its bonus round. AND you get up to 4x multipliers. The action is set against an epic jungle set, with pre-historic dinosaurs roaming the reels. This is a big, high volatility game, not for the feint-hearted, but well worth a spin if you have the cash to spare to chase down those thrilling wins. Have a go at BGO.com today. This one may not have 4,096 ways to win, but it sure is a volatile game engine. Plus it comes with a free spins round with up to 29 free spins to be won, 2x multipliers, and sticky wilds all over the reels! 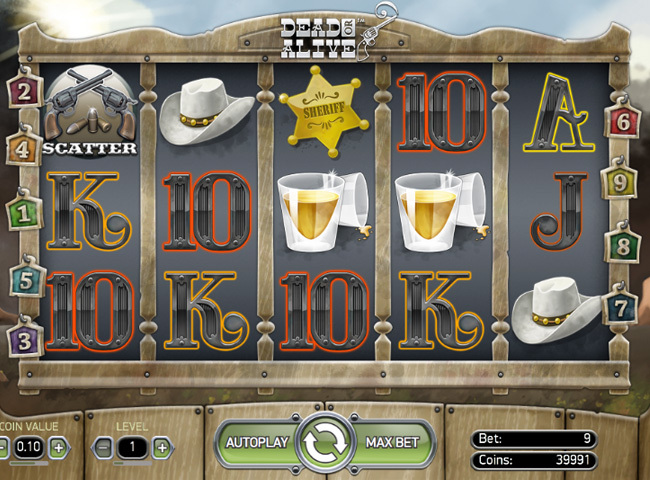 The game has 5 reels and 9 paylines and you can play from up to £18 per spin. As you would expect from a NetEnt game, the features and gameplay are very exciting, and the payouts can be huge. But beware, it takes patience to win on Dead or Alive slot. You can play right now at Casumo Casino.